Winter brings a bitter chill and an invitation to keep a stack of books and a pot of hot tea close at hand. This is a time of respite and recuperation. Or so it would appear. But as every gardener knows, our world is always in transition, at work, even when there is an appearance of rest. Deep in the hard earth, many things are happening, waiting for spring’s entrance. I have returned to the Artists in the Garden theme that explores the profound connection of creative endeavour with that of gardens and nature. The intermingling of sun, soil, seeds, and water brings forth new life, even as an artist gives birth to an internal vision that seeks an outlet. Giverny, the home of Claude Monet, is a quintessential artist’s garden. According to Giverny’s official tourist site, over 500,000 visitors stroll the paths of the two gardens: Clos Normand in the front of Monet’s home and the Japanese inspired water garden on the other side of the road. A sleepy rural village with roots dating to the Neolithic period, grape cultivation from Merovingian times, and a church built in the Romanesque style during the Middle Ages, became transformed with the arrival of Claude Monet in 1883. Giverny became Monet’s home and sanctuary. His garden stretched into a massive landscaping project, which became his ever-present source of inspiration. 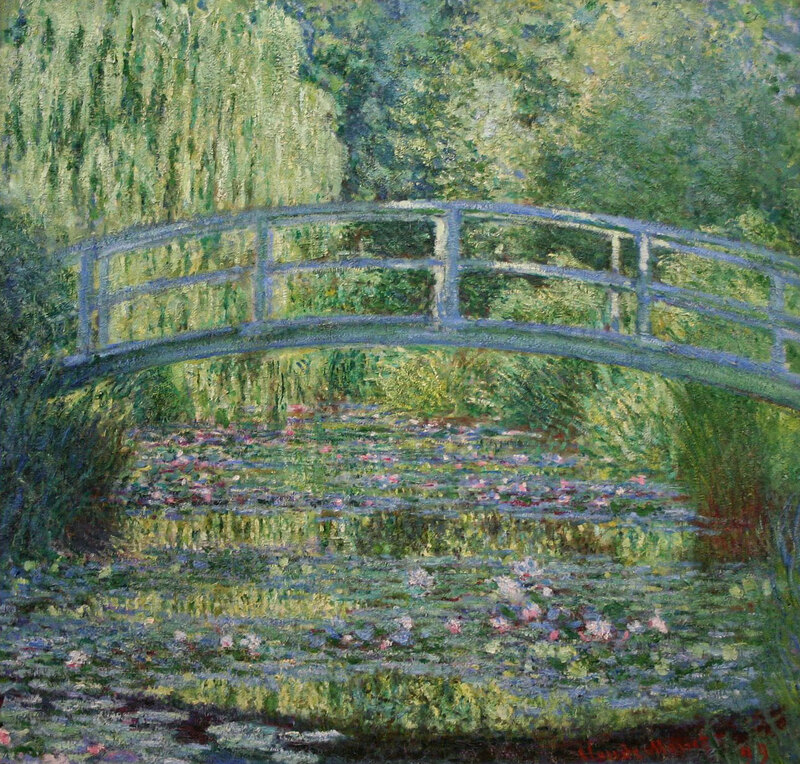 The year 1899 marked the beginning of Monet’s painting of water lilies, first with the Japanese bridge in the background, followed thereafter with a series of magnificent large-scale paintings. Giveny, with its passing seasons and variations of light became the place where Monet created his most beloved paintings. Celebrating Paul Cézanne’s 180th Birthday. This post is well-timed for me – we were just discussing (in the comments section of my blog) my longing to go to Giverny. Jeff and I had planned to go there in March 2016 but we had to cancel due to his metastatic brain tumor being diagnosed just 10 days before our departure. I still hope to go there one day.This just feeds my determination, even if I have to plan a trip just for that single destination. What month would be best to go there? That will be the really tough choice, I think. You MUST go!! We went the first part of May when the flowers were just beginning to bloom and before the busy, tourist season. Over 500,000 people visit Giveny every year, but even with many people sharing the path, there is a reverence that pervades the garden. Even at its busiest there is a quiet tranquility. To me, Monet created a sacred space that revitalized his spirit. My greatest takeaway from our visit, was that we need to reconnect with nature. Visiting Monet’s garden in Giverny is like being in a 3D version of his paintings. It’s quite amazing to imagine how much he was interpreting the reality around him or creating a garden that was fitting with his projections of natural beauty and colours. A real treat! How very well said – it was exactly like a 3D version of his paintings. Monet’s ability to integrate his creative spirit within the world around him was especially meaningful to me. When Monet said “My garden is my most beautiful masterpiece” he demonstrated that the “real” world could be described in terms of art; the effort taken in gardening was akin to working with a paintbrush. To me, this is a message for all of us: we create art in many ways. We are all artists. Thank you for your visit and adding to the conversation. Looking forward to our ongoing dialogue. Monet indeed personifies the sublimation of painting and nature into a very unique fusion where the canvas is a delightful mirror to both the soul of the painter and the nature surrounding him. The true essence of Impressionism. The mirror symbolism is excellent! I’ve been to Monet’s gardens and you portrayed the place perfectly. To go into his house and studio was a real treat, but to see his gardens and know that his ideas and imagine brought them to life for his paintings. He is one of my favorite artists. As an artist, you would a profound understanding of the visual impact of the intricate colour variations against the background of seasonal changes. Since discovering how artists are connected to their gardens, and to the earth’s movement, I have learned that we all must take the time to reflect and be aware of our surroundings. I think of Georgia O’Keeffe’s thought: “Nobody sees a flower – really – it is so small it takes time – we haven’t time- and to see takes time, like to have a friend takes time.” So glad that you stopped by for a visit. I have been following for these productions in Canada. They look absolutely wonderful! I just checked out the link and there is a download function so will see if they can be downloaded in Canada. The ability to view art exhibitions via technology if remarkable. I enjoy the videos from The National Galleries Scotland! https://youtu.be/Ru6e8ar6mIg. What a wonderful contribution, Rebecca! I like Monet and thank you very much for the information. I did not know that Monet had two gardens, great. I also garden with a lot of dedication. I wish you a happy time. Thank you, Ernst, for your heartwarming comments. Gärten verbinden uns mit der Natur. Wir gehören zu dieser Erde und fühlen uns zu Hause, wenn wir zwischen Gärten, Wäldern spazieren gehen. Unser Herz ist in Frieden, wenn wir die singenden Vögel und den Fluss eines Flusses hören. Beautiful! The video reveals what I only recently learned about Monet, the gardener. He designed his own gardens and considered them his greatest art. Monet created from both perspectives, the planting and the painting. What light, what vision! Yes – I love that idea. The planting and the painting. I believe he saw them and one and the same. What I find most interesting about Claude Monet was his recognition that we cannot be separated from nature, that we belong to the earth. “I want to paint the way a bird sings.” Monet understood that art comes in many forms: that nature, birds, animals are capable of creating magnificent artwork. Creativity is a gift given to all creatures that share our planet. I find that comforting. Lovely post for a winter morning Rebecca! Thank you for this marvelous post. Claude Monet is my most beloved artist of all, every one of his paintings is an inspiration, as is this outstanding post of yours. I did not know that he had two gardens and that a lot of his paintings were from his own home and gardens. Incredible that his famous water lily paintings were from his own garden. I believe that he appreciated water because many of his paintings use water settings with boats. Because I grew up on a farm I find his paintings on open fields delightful.. I am delighted that you enjoyed the post. Claude Monet wanted to document the countryside of France, in all seasons. He would paint the same scene over and over again to capture the variation of colours. Can you imagine what it would have been like to be an observer? 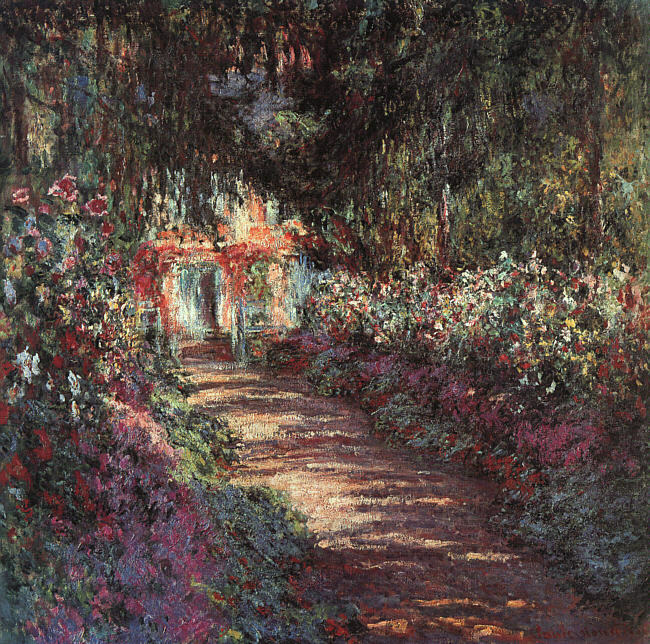 I believe that his move to the Giverny satisfied a yearning to be closer to nature. He said “The richness I achieve comes from Nature, the source of my inspiration.” May we all recognize and experience the beauty of the world around us. Oh how I’d love to visit his garden! Monet has always been my favorite of the Impressionist painters. I share you enjoyment of Claude Monet’s paintings. A few years ago, Vancouver Art Gallery had a exhibition of Monet’s paintings that were created later in life, some when he had difficulties with colour perception because of having nuclear cataracts in both eyes. 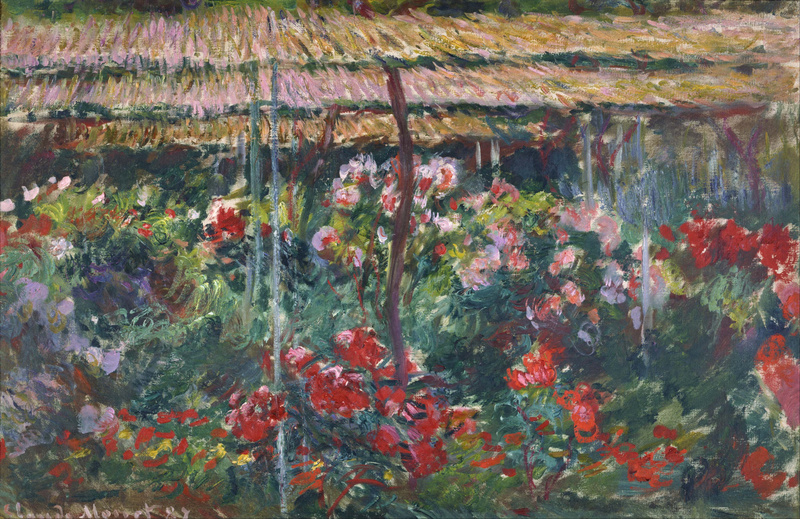 What amazed me – each painting was a testament to Monet’s relentless desire to create beauty. Wow, I didn’t know he had issues with his eyes. Very interesting. In 1923, Monet had cataract surgery after a prolonged period of worsening eyesight that cause him to have long stretches of time between painting. He was determined to paint – truly inspirational. I can’t imagine how frustrating that must have been for him. To be able to see what he wanted to paint in his mind’s eye but not be able to put it on canvas must have been depressing. Have you thought about pursuing an artistic endeavour? How do you integrate creative beauty within your busy schedule? Welcome to Chasing Art – searching the ordinary for the extraordinary.